Last Friday, just before 5 a.m., two people traveling in a minivan died after colliding with a garbage truck on Philips Highway in Jacksonville. According to a story by Jacksonville.com, the minivan was heading southbound on Philips Highway on the inside lane when the garbage truck pulled out in front of it. The garbage truck turned left from the outside lane into the path of the minivan to make a left turn through the median. Not having time to react, the minivan struck the rear end of the garbage truck. The minivan overturned and the driver and the passenger, both males, were found dead when emergency crews arrived shortly thereafter. Part of Philips Highway was closed for nearly four hours as Highway Patrol worked to clear the accident. One of the two occupants was wearing a seat belt. The driver of the garbage truck was wearing a seat belt and was not injured. Collisions involving large trucks and regular size cars are often fatal for the occupants of the car. More than 100,000 people are involved in a collision involving commercial trucks every year. 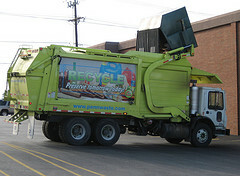 Injuries arising from collisions with garbage trucks are especially severe and often fatal. This is not surprising when you consider that a full size garbage truck weighs about 25 tons, compared to just 4,000 pounds for an average car. The law generally requires that all drivers remain attentive while driving, in order to discourage accidents like the one mentioned above; when drivers stop paying attention, people get hurt. To ensure that drivers are attentive, respectful, and take driving seriously, the law provides those injured by inattentive drivers the opportunity to seek compensation for their injuries. This is called the law of negligence. Negligence, if proven by a plaintiff, can provide actual and, in some cases, punitive damages to the injured party. Punitive damages act to “punish,” or discourage, certain types of behavior. To prove negligence, a plaintiff must show that the other driver acted negligently and that actions caused the plaintiff’s injuries. For example, recently some courts across the country have started issuing punitive damages to plaintiffs injured by drivers who were texting while they caused the accident that injured the plaintiff. Assessing punitive damages, which can often be quite hefty in size, is an effective way to discourage behavior that, while it may not be technically illegal, is undesirable and negligent. In fact, texting while driving is actually against the law in Florida as of this year. Drivers cannot be pulled over solely for texting however, as it is considered a “secondary offense.” However, what really may deter drivers from texting is the fact that, if they do cause an accident, they may be responsible for punitive damages if the case is decided against them. If you have been injured by a driver who was not paying attention while they were driving, you may be entitled to monetary damages. The best way to find out what rights you have is to speak with an experienced accident attorney to discuss the facts of your case. Meeting with an attorney is a good way to assess the situation and see what course of action is best for you. Click here to contact one of our experienced accident attorneys. Speaking to an attorney is free, and you will never receive a bill unless we are able to make a recovery on your behalf.